Salmon and Steelhead on the Klamath River are increasing their presence as each day passes. The Klamath River fall fishing is always good but this is the first season I have seen steelhead actively feeding on eggs in September. The salmon and steelhead are both biting and eggs have been the go to bait. We have been back-bouncing and boon-doging for salmon and side drifting for steelhead. We are getting 1 to 3 salmon, and 4 to 6 steelhead a day. 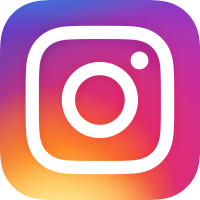 The time of year we all have been waiting for is here, if you haven't made your plans to get to the famous Klamath River you're missing out. I have boats available for 3 days only in October, so you better act fast. 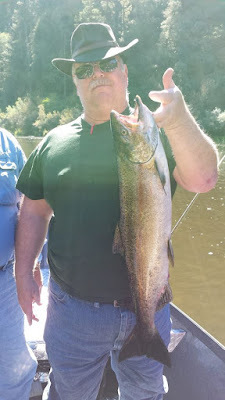 Klamath River fishing is starting to pick up, we are seeing salmon and steelhead in the middle section of the river. Most boats are getting a couple opportunities at some salmon and 3 to 5 steelhead a day. The rain this week should get some of the fish that are kegged up in the lower river heading for higher ground. 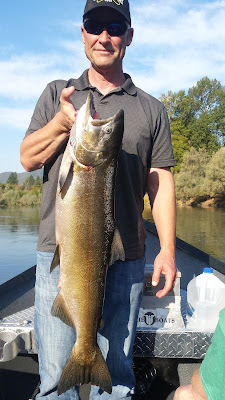 We are getting geared up for our most productive and popular season on the middle Klamath River and only have a couple days left this fall so you better speak or forever wish you did.